2. General Information – Windsor Montessori cares about you and your company. We are concerned about all our clients’ privacy and computer security. We follow basic rules to make sure that your privacy is not invaded, used and/or abused. 4. Dispute Resolution – In the unlikely event that a visitor to our website feels that we have somehow violated our own policies, please see the CONTACT page or email us at WindsorMontessoriSchool@gmail.com. 6. 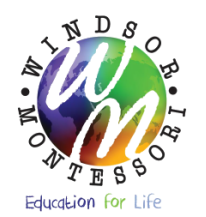 Information Recipients – Windsor Montessori employees have access to the personal information sent in by visitors to our website. These employees have a signed a document stating that they are in deep legally if they divulge any personal information to anyone about a client/customer. 8. Opt-In and Opt-Out – You may have received an email or filled out a form on our website that gave you the choice to “opt-in” to having your name and email address added to our email list for newsletters and other periodic emailings. People who have “opted-in” will receive these bulk emails. As a client, affiliate, etc. if you have ever given us your personal information personally by phone or by some form of “contact” form on our website, we have added you to our email mailing list. At any time, you may request to have your personal data removed from our database. It’s as simple as sending us an email at WindsorMontessoriSchool@gmail.com or “unsubscribing” from our mailing list by clicking “unsubscribe” on the email that we sent you.